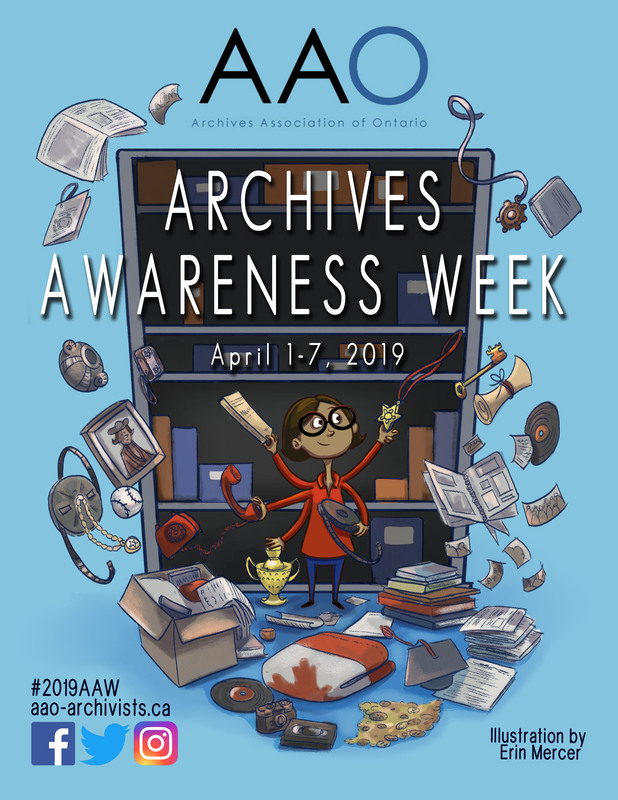 The AAO has designated April 1st to 7th as Archives Awareness Week. Take this opportunity to celebrate your archives and the importance of your collections and documentary heritage in the community. Use our AAW poster to celebrate and promote your archives! To have your event listed here email the AAO Archives Advisor. Check back often for new event listings. 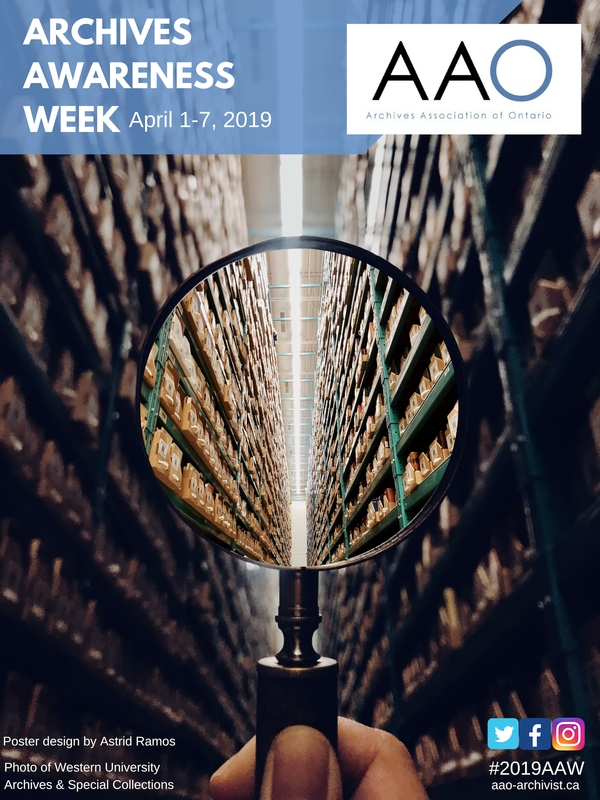 Members can check out our Archives Awareness Week 2019 Resources. Tweeting about events? Use the #2019AAW hashtag! Tour the vaults of HPL’s Local History & Archives. Staff take you on a tour through the archives and share some of their favourite items from their collections. Discover the resources available to uncover your property's past. Presentation and discussion on researching the history of your house or property using documents, photographs, maps, and other local resources. A regular feature at the Lambton County Archives is the photo X-Files. This includes photographs from newspapers, family albums, and assorted donations. The X-Files is open to the community to help identify the place, time, date, who is in the photo, or anything else they may know to help close the book on these files. Join us on Wednesday, April 3, 2019 and bring in your own unidentified photos so we can help you solve your X-File mysteries! The Archives of Ontario is hosting a symposium about how social media is changing the ways that the GLAM sector (galleries, libraries, archives, and museums) connects with audiences. The event will be an opportunity for social media practitioners to share successes and challenges, and meet others in the GLAM sector who are creating content, promoting their institutions, and encouraging dialogue on social media. Further details and registration to participate in-person or remote attendance here. Need help tracing your ancestry? The Lambton County Archives is offering a beginners class on genealogy, Thursday, April 4, 2019. Work on your family tree, discuss research strategies, and discover resources both online and in the Archives vault. Our Archives Assistants will be on hand to answer any questions and share with you tips on how to get the most from your resources. Beginners and experienced researchers alike can enjoy access to Ancestry Library, troubleshoot research questions, and chat with like minded individuals also on the journey to genealogical discoveries! A free resource sheet and ancestry forms will be available if needed. Access to free WiFi. Join the AAOEe on April 4 as we explore the NAC Archives with archivist Robert VanderBerg. See behind the scenes of Canada's premiere arts performance space, and get an inside look at the materials preserved from past dramatic, dance, orchestral and other arts-focused events. This unique collection is not to be missed! After the tour, come across the street to D'Arcy McGee’s for a bite or some liquid refreshment. Space is limited to 20 participants. RSVP required. Contact AAOEe for more information. Archives staff will lead you on an exploration of “the Stacks”, historic documents, and photographs, some of which are related to “The Bruce” documentary and book. Learn how to access cemetery records from the Hamilton Cemetery office located on York Boulevard. Presented by the City of Hamilton’s Parks and Cemeteries division. Publishing new collections on Digital Archives portal. There will be a series of articles published that introduce the collections during AAW available here. Tours of the Canada Aviation and Space Museum Library and Archives will be available to staff and volunteers. Installed a new exhibit featuring staff picks from Archival and Special Collections. Staff members have selected their favourite items for display. Collections and various aspects of the collection and work will be highlighted on various social media channels.